Now that the holidays are over and we’re all getting back into the swing of things, I’m trying to be a little more organized with my life. This means having a morning routine and a clear plan for breakfast. 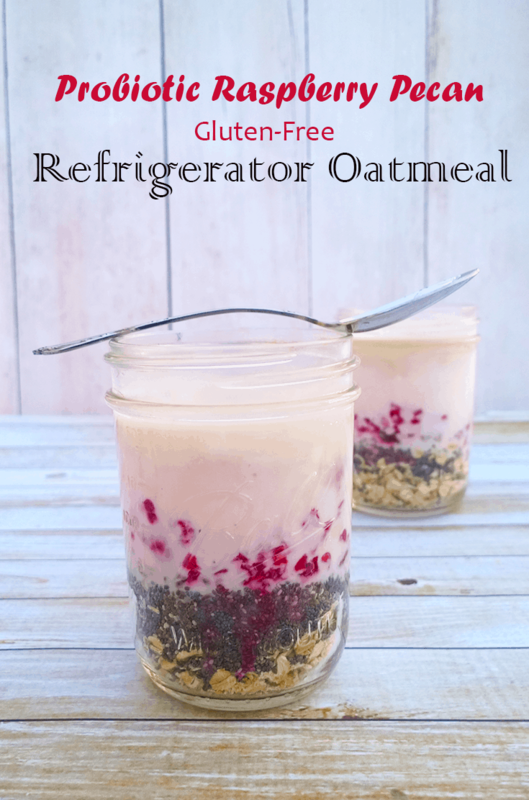 This probiotic raspberry pecan refrigerator oatmeal is an easy way to have a quick, yet nutritious breakfast in the morning. If you have kids in school, have to head out the door for work in the mornings, or both, then you know how crazy breakfast time can be. Even when I stayed at home, just the thought of making breakfast was an emotional drain some days. Yes, I usually make something like eggs and hash browns with a side of fresh fruit, but that can be time consuming. And as much as I love the nutrition from a homemade fruit and veggie smoothie, that can be pretty time consuming too. I’m getting tired of feeling behind for the day before I even get out of bed. Since we opt out of pre-packaged breakfast cereals full of sugar and wheat, that didn’t leave us a lot of quick options. 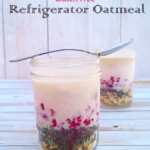 With this probiotic raspberry pecan refrigerator oatmeal though, you won’t even miss the box. Not only does it taste delicious, but it’s packed with nutrition too! The chia seeds provide fiber, protein, calcium, magnesium, B vitamins, and brain boosting Omega 3 fats. The oats help fill you up and also provide fiber and various minerals. My favorite addition, though, is the probiotic boost from kefir. It’s tangy and smooth, giving this a rich taste. If you make your own kefir or buy some plain, then you’ll want to add the full ½ cup of raspberries to yours. I was able to find a raspberry flavored kefir at my local health food store, so I opted for just the ¼ cup. Perfect for a quick breakfast or snack on the go, you'll love the taste and your body will love the nutrition! 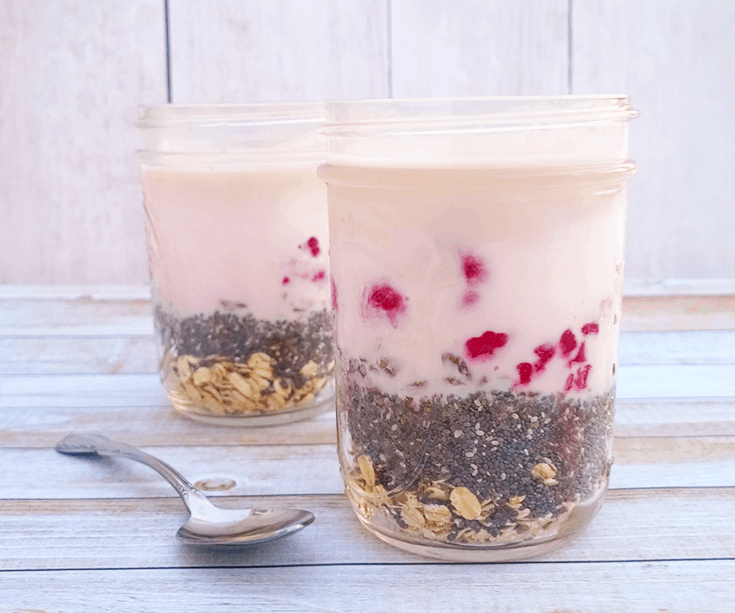 In a pint sized mason jar combine the chia, raspberries, pecans, oats and honey. Add kefir until the jar is mostly full. You’ll want to leave about 1 inch of head space. Stir well to combine. Give it a taste and add more honey if it’s too sour for you. I’ve found that homemade kefir needs more honey than storebought. Place in the fridge for several hours or overnight before enjoying chilled or at room temperature.